There are some heavy-hitters arriving on the Switch over the next few weeks, one of them being DOOM. It'll be fascinating to see how this one is received on Nintendo's system, and those eager to jump in as soon as it lands on 10th November may be looking into pre-orders. Just last week Nintendo of Europe confirmed that The Elder Scrolls V: Skyrim is now available for pre-purchase / preload on the eShop in the region, and now DOOM is also up for grabs. With the download clocking in at 21.3GB in the EU those looking to get started right away at midnight on 10th November should perhaps consider ordering ahead of time. At the time of writing the eShop pre-purchase options for these two titles aren't available in North America, but we'll keep an eye out for any updates. Are you planning to pre-purchase many eShop games on the Switch? Oh dear. These preloads are getting me to spend more. Skyrim is up for pre load in NA. None for me - hope they sell well though, then more 3rd parties will put heavy hitting, high profile games on the Switch. I'm just going to pick up the physical in store. But they hype is real! Been listening to the game soundtrack on Apple Music. Excited for Skyrim too. Getting the physical copy here. Can't wait until Friday! I'm buying doom physically on Friday! 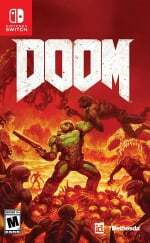 Physical of Doom ordered £37.99 Amazon.uk with the prime discount. Doom for me, physically that is! Physical purchase for me if I do get it. Might wait till new year though. They can have my money if they add gyro aiming. And then it will be a physical copy. I want it but I can't afford it right now. lol. Got it digital for £36! Can't afford it right now, but definitely for Christmas! As soon as I have the money me will buy and then as olivia newton john would say. @slinkyjynx this is a brand new release on Nintendo Switch, they are not gonna launch at ten or twenty quid. Hard copy all the way. I'm going physical on this one. Very excited and I want to support Bethesda I think they have shown their willingness towards us Nintendo gamers. I am getting all three of their announced games on day one. meh... I wish them luck. Been there, done that. Pay an extra $40/$50 dollars just to play it on the go would not be worth it for me anyway. I already supported them by buying The Evil Within 2 and Wolfenstein 2 last month. Does anyone know who has the rights to DOOM 64? They should release that game on Switch as well. It was such an overlooked classic on the N64 and deserves a 2nd chance. I get paid on Wednesday and I will be getting this, LA Noire & Skyrim digitally. This pre load function convinced me to buy the digital version. Right now I’m downloading that 21gb of data. My poor micro sd card! @MartyFlanMJFan I get you but there are other cross platform games released at the same price. Granted they're indie titles but my worry is that it isn't going to sell as well as it can because of the price, then the publishers will in time say they didn't do well enough on the switch to warrant further game releases and we all lose. I want them to do loads of games for the switch that everyone can enjoy, but at a reasonable price that's all. I hope this sells well on Switch. Come on people let's support this mother so we get more! Oh hell, just checked the storage on my switch. I have a 256gb Card, and with doom downloading, and Skyrim already on it, plus all the others, I now have 60gb left. And LA Noire is going to take 27gb. Guess I will be buying that 400gb so Card now. Blimey. Sandisk, can you not release a 1tb Card for us please. £37.82 (plus bank charges) on the South African eshop. Applies to both Doom and Skyrim. Going digital only is getting ridiculously expensive. Like the idiot i am, i'm just after splashing €120 for these two. Got my physical version on preorder for Friday. So hyped for this. @slinkyjynx "I get you but there are other cross platform games released at the same price." This game had to have a lot of work done by an outside team to get it working on Switch. This game wasn't originally meant for the system. Also, comparing the sale price a year after release to the Switch launch price is disingenuous. Launch price on Switch is the same as launch price on PS4 and X1. @Indielink OK that wasn't fair of me to compare the sale price but looking back I see that Skyrim Special Edition was released at £30 on all platforms when it was relaunched, which is still £20 cheaper than we're getting it at, even before you account for the switch tax on physical copies, right? @electrolite77 £36 plus us Revolut bank app to avoid any charges!!! @WaveBoy It is perfectly acceptable. The real unacceptable thing is whining. Never played skyrim. Never played doom. Getting both. Physically of course. Got my preorder in, can't wait! Up until last week I hadn't played a DOOM game since like 1993. I bought/played through DOOM 3 for ogXbox last weekend just to prep for this; definitely a different experience but I highly recommend it if you haven't played it. I'm pretty excited! Pre-ordered physical, though. Talk to you all Friday when we get DOOMed!!! @slinkyjynx skyrim special edition was definitely not £30 on PS4 and Xbox one when released. @WaveBoy there is nothing wrong with FPS, its very acceptable. Its just that pepele are used to having better but 30fps is the minimum standard for video/visual-media. If 60fps is that important then buy it on PS4, but it doesnt devalue the Switch version at all. It being full price isnt to complain about either. Doom isnt a game i will buy a PS4 for and i dont think i wouldv bought it if i owned one, im more of the japanese kinda games or otherwise action games like God of War. Doom stands out on the Switch because its the most visual gory title on the Switch' also has a nostalgic effect for lots of nintendo gamers, and its the biggest FPS on it. Know that not everybody has a gameconsole or is that interested to buy one instantly or something. Theres lots of folks who buy a console just for fun and arent that buissy with frames per seconds or resolution and some still claim to be gamers without caring about that. @slinkyjynx Skyrim SE was 60 US dollars on all platforms at launch. Skyrim SE on Switch is 60 US dollars at launch. @WaveBoy You say you can deal with the resolution drop and then complain abiut blurry visuals. Like what? Now everyone, man up and buy the game ! How is the evil within 2 compared to the first one? I will be doomed this Friday! physical copies for both Doom and Skyrim, no eshop downloads absolutely unless there is none physical. @WaveBoy they are as sharp as the Switch will allow. And 720p is inherently less sharp than 1080. November is the reason I just bought a Switch... I only have Zelda, Mr. Shifty and Rougue Troopers Redux... I’ll be getting Doom cartridge on Friday, because you still have to download multiplayer... I want MARIO, LA Noire and Skyrim as well... and Snake pass... this month is crazy. @slinkyjynx Though I bought thw game at 60 and still loved it, despite not being able to bring it with me. @SetupDisk It has better pacing, the story also has an actual starting point. Biggest change is that you in an open town "hub", so you can do things at your own pace up to a point. The game can lead you to a warehouse in town (all hell breaks loose inside) but you can decide to just walk back to the safe house on the other side of town for some coffee (health) and the work bench before doing that. Or follow a signal to a side quest to an underground warehouse that can get you a shotgun. But unlike the first one that starts at 10 off the bat with the chainsaw guy after you. This takes a bit to get really crazy. I do not think it looks any better - but for whatever reason it runs about 5 frames slower from the first one. I got it for $29.99 on PC. @Sanangelo89 Yeah, it DEFINITELY Does devalue the Switch version, ESPECIALLY at full price. @NabbitFan730 it doesnt for me. Its a game iv never played on my new console. When you want to sell products in the future, lets see if you are just ast generous. This is the same way I felt but now what’s the point of a physical game when it can’t even be played because less then half the game is physical and the rest needs to be downloaded. My solution all Nintendo games physical all 3rd party digital.